SEOUL – It’s not a case of crash and burn but the other way around, for the Samsung Galaxy Note 7 smartphone. The manufacturer on Tuesday permanently halted production and sales of its flagship phone after failing to correct a problem that was causing the devices to burst into flames. 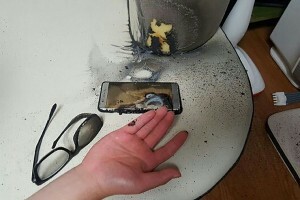 In August, the South Korean-based firm ordered the recall of 2.5 million Note 7s in 10 markets following complaints that its lithium-ion battery exploded while charging. It had identified a “battery cell issue” as the cause of the problem. But even after changing battery suppliers and updating the phone’s software customers were reporting that the replacement devices were still catching fire. “Putting consumer safety as the top priority, we have reached a final decision to halt production of Galaxy Note 7s,” Samsung said in a statement, advising customers to stop using the phones. A compensation scheme is being put in place. Users will be offered the choice of either getting all their money back or swapping the Note 7 for an older, smaller-screened Galaxy S7 or S7 Edge phone plus a partial refund.